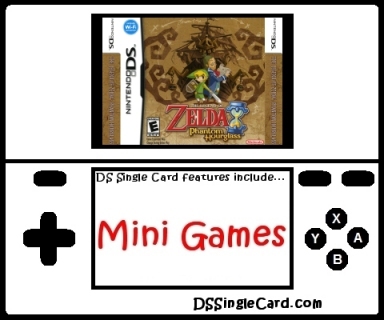 Navigation is The Legend Of Zelda: Phantom Hourglass to the Single-Card Download option is simple, quick, and self explanatory. The options are located in a location that makes sense (Main Menu to (save file) to Battle to DS Download Play). The opening credit sequence is short and skipable. Download time clocks in at just under 30 seconds. All of the menu options are on rectangular bars that are large and easily labeled. With half-way decent tapping aim, you won;t accidentally select the wrong option. The entire game is controlled on the touch screen. While playing as Link, he follows the stylus, running faster the further away from it he is. While controlling the three Phantoms, you literally draw out their path and they follow it. It's sometimes a little difficult to draw paths through the narrower corridors, especially when trying to make the Phantoms catch up with Link. Screen angles of the battlefield (not the map) are slightly different, giving the advantage to the Phantoms, but the advantage is taken away again by the fact that it's easier to redirect Link's movement on extremely short notice. Link's rolls (see DSSingleCard.com's The Legend Of Zelda: Phantom Hourglass Hints), while unnecessary most of the time, are difficult to master and often times inconsistent. The 3D graphics look amazing. The sound is apporpriate and helpful. As far as options go, this game was created exclusively for multiplayer - which is an amazing feature - but the options for it are a little light. There are eight stages to choose from (and a random stage selection feature). Players cannot, however, choose their color, their base, the number of rounds, the length of each round. The Legend Of Zelda is one of the longest-running, most revered series in video game history, and for good reason. In Phantom Hourglass, the series makes its first appearance on the Nintendo DS. The game, a de facto sequel to the Nintendo Gamecube's The Legend Of Zelda: Windwaker, adds in a multiplayer mode - something rather rare in Zelda games. This one was specially designed and not just thrown in. In the included Battle mode, two players (playing as either Link or three Phantoms) play their respective roles simultaneously; this means no downtime. In addition to Single-Card Download play, the Battle mode can be played using Multi-Card Play and the Nintendo Wi-Fi Connection, with slight variations. The game is extremely fun. With each playthrough lasting up to 12+ minutes, and eight different boards to play on, there's an awful lot of replay value for a "mini" game. The game includes as much strategy as you want it to. The level of challenge is dependant on who your opponent is and how much experience they have with the game. Overall, the game is developed to a level much better than some "main single-player games" are. If expanded, this Battle mode could be a full title all on its own. In four words: Get it and enjoy! Offer guests' choice of a standard download or a download that walks the guest through the tutorial and then begins the game. Allow players to select which color they want to be and, separately, which Base they want to inhabit. Permit hosts to earn their Big Plays in Single-Card Download play. Include options for the number of rounds the players want to play and the length of each round. Make a Create-A-Stage option for Battle, along with the ability to download additional stages. Click here to return to the DSSingleCard.com The Legend Of Zelda: Phantom Hourglass profile.